Do you have dry or oily skin? Is your skin sensitive? Are you dealing with a skin condition, or just getting older? Try these skin treatments to help rejuvenate your outer layer. Caring for your skin can involve both basic steps and more specialized treatments. Some treatments you can do yourself, while others must be performed by a professional aesthetician or dermatologist. What kind of skin treatments are right for you? Facials: A professional facial treatment will help clean your skin more deeply than your regular daily ablutions. During the facial, a professional aesthetician will cleanse your skin. Extractions may be performed to clear dirt, excess oil, and other debris from your pores. The facialist may use steam to help open up your pores and also lightly exfoliate, tone, and moisturize your skin. Masks: Different types of masks can be used to treat various skin concerns. 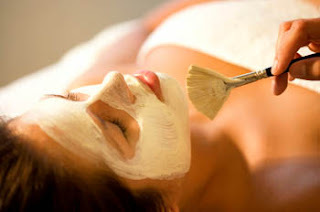 Some masks, like clay or mud masks, can be used to remove excess oil. Fruit extract masks made from papaya or pineapple enzymes can help dissolve dead skin cells, surface oil, and dirt. Moisturizing masks that contain shea or cocoa butter, vitamin E, oils, and other emollients can help soothe and reinvigorate dry skin. Peels: Chemical peels exfoliate the skin with salicylic, glycolic, or other alpha hydroxy acids (AHAs). These types of peels penetrate the surface layer of skin. Stronger, medical-grade peels may consist of trichloroacetic or phenol acid and go deeper into the skin. These peels should be performed only by a dermatologist. Microdermabrasion: This nonsurgical exfoliation technique can deep-clean pores, reduce the appearance of fine lines, wrinkles, and creases, and erase sun damage and minor scars. Microdermabrasion can be performed by a dermatologist or a licensed aesthetician. If you have trouble with acne, the following treatments can help clear up your skin. Phototherapy: Laser and light therapies can help improve acne and eliminate scars that result from acne. Also check out our Blemish Control Advanced Facial Treatment includes this amazing phototherapy treatment. Older and wiser may be okay with you, but wizened (meaning dry, shrunken, and wrinkled!) is another story. Most people find it difficult to embrace the physical signs of aging. Your skin care therapist or dermatologist can counsel you on wrinkle treatments, such as Botox and other fillers, as well as treatments like face-lifts, non-surgical face lifts, microcurrent treatments and laser therapy that can help keep your skin looking youthful and fresh. Botox and fillers: Botox and its competitor, Dysport, are brands of botulinum toxins that are injected into facial muscles to prohibit them from contracting and causing wrinkles. Other fillers, such as Restylane and Juvéderm, are used to combat collagen loss and to “fill in” wrinkles. They don’t disable nerves and muscles the way botulinum toxins do; instead, they create volume and replace fullness. Non-Surgical Face-lifts: When facial skin starts to sag, microcurrent treatments can tighten your facial muscles and your skin to make it look tauter and firmer. At Skin & Beyond we offer the Lumilift Facial treatment-also known as the non-surgical face lift. The Lumilift is a revolutionary way of rejuvenating the skin and lifting sagging muscles. It is performed with two (2) special electrodes that feature an advanced application of Micronized current, HF polarized current and light energy. During the LumiLift® treatment, a pulsating light is directed at the skin surface. Light passes through the layers of the skin and penetrates into the dermis. This powerful light stimulates the fibroblast cell to produce more collagen. The increase production of collagen smoothes and softens the appearance of wrinkles, reduces the size of pores, and improves skin texture. At the same time, the electrodes emit Micronized currents to tone and life sagging muscles. At the end of the treatment, an antioxidant product is infused into your skin using two special electrodes to smooth away facial creases. Phototherapy (Lumifacial)-For anti-aging treatment, uneven pigmentation, acne, redness or just a good rejuvenating and preventative treatment. The LumiFacial® targets common skin problems; such has acne, redness, and uneven pigmentation. During the treatment, a wrap-around facial panel is positioned in above your face. The physician or technician selects the specific Light energy required for your skin type and condition. At the end of the treatment, the technician will apply specialty products using a polarized current. This final step enhances the penetration of these products and promotes their efficacy. You can immediately return to your normal routine with no redness or peeling. We have different advanced facial treatments that include the lumilift and the lumifacial treatments. For every spa treatment depending on the condition of the skin and on how fast you want to see results; a series of 4-6 treatments is highly recommended. Getting a better understanding of common skin treatments will help you determine which therapies may be most effective when it comes to addressing your personal skin care, acne, and anti-aging concerns. But as always we are always here to advice you on maintaining or achieving a beautiful skin! Skin & Beyond offers spa treatments for women and men providing the highest in relaxation and rejuvenation, along with the latest developments in skincare. Under the personal guidance of Medical Aesthetician/Spa Owner Martha Revis & Aesthetician Nathaly Tanner will ensure you a personal and memorable spa experience. We are not about spa trends, but offer spa treatments that give you real results and our products will help you to take the spa experience home with you. We hope you visit us soon, we want to be partners in your skin care! Visit our website to view our products and services or call us 615-794-5282.